ComboBox is the most useable control in programming. In .NET 3.0 it is different from all previous version of .NET. 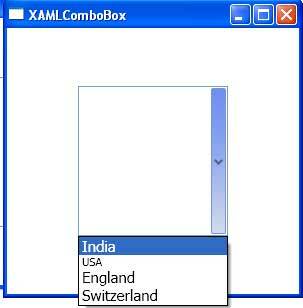 The element represents a ComboBox in XAML. A ComboBox is a collection of ComboBoxItems represented by element in XAML. Here in this article I am going to show that how we can create ComboBox and how we can add item in the ComboBox. By default, the ComboBox height and width is full screen. In a ComboBox we can use CheckBox item, Images etc. We can also add images in a ComboBox. We can do it by using a ComboBox property. 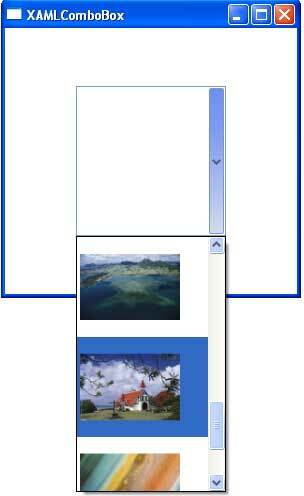 This window1.Xaml code is showing that how we can add images in a ComBox.